Modern carpet has been engineered to hide soil so well that if one waits for the carpet to “look dirty” before cleaning, it is beyond maintenance and into restoration. Some damage from abrasive soil may have accrued and cleaning will be of little help. With today’s cleaning systems, it is best to clean soon and often in order to prevent the level of soiling from reaching the “dirty look” that would require professional restorative cleaning. Eighty-five percent of soil is dry soil that can be removed by vacuuming frequently (and by pile lifting on commercial carpets.) Fifteen percent is oily soil and can only be removed by cleaning. 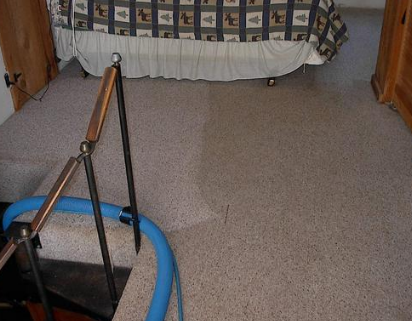 For deep down cleaning and superior results we use the “Hot Water Extraction” method (also called Steam Cleaning) to clean your carpets. First we apply traffic lane cleaner (TLC) on all traffic areas, then we custom select the best cleaning agent for your carpet via Hot Water Extraction. After cleaning we can also apply a carpet protector to help keep your carpet looking new.